High above the frenzied pace of the city, Lake Arrowhead Resort & Spa is situated at an elevation of 5,106 feet in the San Bernardino National Forest, along the shores of picturesque Lake Arrowhead—with plenty of fresh air and clear-blue sky! From boating tours and fishing expeditions to skiing and snowboarding, there's plenty to do year-round for fun and excitement. The Lake Arrowhead Package includes daily breakfast for two at the resort’s eatery, BIN 189, and your choice of one of the following Lake Arrowhead activities: a 50-mnute boat tour, a 50-minute kayak tour, or the Fishing Adventure. Please note: fishing licenses must be obtained prior to the tour or pole rental for persons 16 years of age or older. You may obtain your license online or at Leroy’s in the Lake Arrowhead Village. Members receive up to 5% cash back (off of base room rate only, after travel)! The history of Lake Arrowhead is as rich as the natural surroundings and sparkling view. 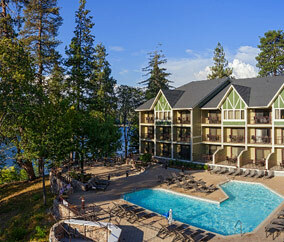 Lake Arrowhead Resort & Spa is far more than just a picturesque place. It inspires loyal guests to create treasured memories, to celebrate each moment, and to rekindle their spirit. It is a state of mind where the ambiance and amenities are merely the gateway to a more majestic experience.